A wedding or any other special event can only be ideal if all details about the event have been considered and planned. 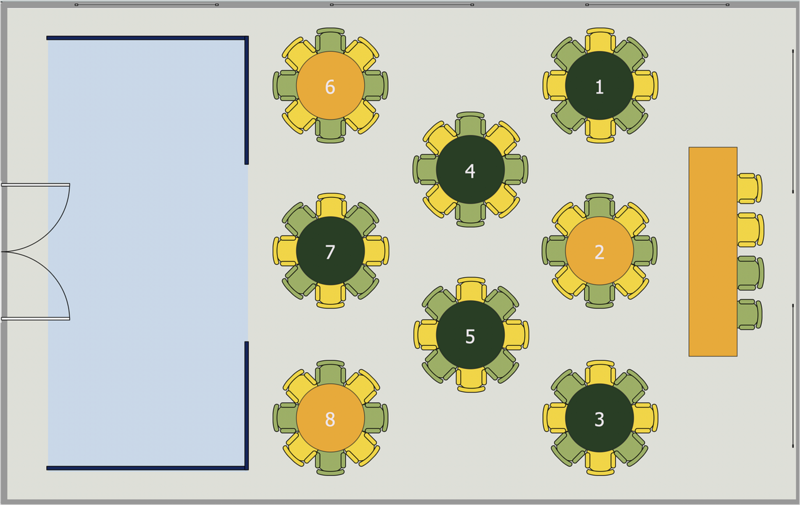 Along with the participant list, and all the details, there is one more thing that needs attention and that is the Seating arrangement plan template of the guests and participants. A seating chart is the best way to represent and arrange seating places for event participants or spectators. The ability to design different seating plans is delivered by the ConceptDraw Seating Plans solution. This solution extends ConceptDraw DIAGRAM with 4 libraries that contain 67 vector elements of seating arrangement. Open a ConceptDraw DIAGRAM new document, select the Seat Blocks library. Also, you might need some objects from Floor Plans section for your seating plan. Set the measurement units and the scale for your document using Document Properties dialog that can be accessed from the File menu. Add objects to the drawing by dragging them from the libraries panel to the document page. If you need to resize any object, open the View tab (View menu for Macintosh) and check the Object Dimensions box (Size Boxes for Macintosh). Then, enter the real object's dimensions in your preferred unit — cm, feet, inches. For multiple depicting of repeating objects, use combination of the Group option in the Arrange&Size panel and the Clone tool. Finally, you can export your drawing as MS PowerPoint® and Adobe PDF using the Export options from the File menu. Result: Using ConceptDraw DIAGRAM simplifies the complex and cumbersome process of wedding or public event organization.